I digress. This is a hipster anti Dead Poet’s Society film. It’s cruel, it’s unrelenting. You see the *twist* coming a mile away and wonder why Miles Teller’s Andrew is gutten for more in that final act. That said, It’s hilarious, J. K Simmons is a genius as sadistic Terrence Fletcher, hell bent in the belief that everyone needs to be pushed to breaking point to reach greatness. The romantic storyline between Teller’s Andrew and Mellisa Benoist’s Nicole is a little underdeveloped to the point of pointlessness (Ok yes, Andrew puts music/drumming first. 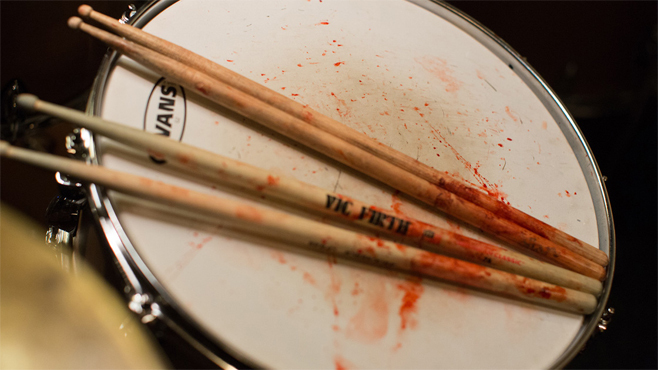 Sleeping next to his drum kit and playing to the point he’s bleeding do that just fine), but I guess it says it all when the only character name I don’t need to look up is her’s. I’m happy to see Paul Reiser of ‘My Two Dads’ and ‘Aliens’ play the role of Andrew’s father. While he plays a vital role toward the end of the film, he is still underused. It comes across as two different films. I would have like to have either seen Andrew completely cut off from everyone, or a little bit more of a development of those close characters; after all, I don’t believe a father as caring as Reisser’s Jim would ever let the problems get so far. The biggest let down for me was that I’d convinced myself from the trailer that Sam Caflin was playing a part in this movie. Alas, no Finnick to cheer me on my way. The music was good. However, shouldn’t I be saying the music was great, fantasic, superb. I love my jazz, but the story took it away from me. Jazz, to me, is about expression and soul. Neither of which I saw represented in this film. Now, I did what I NEVER do with this movie. I read a number of reviews first. I was trying to convince myself that I didn’t need to see this movie. They all raved about it, stellar performances (I’ll give you J.K, but check out 21 and Over for a better performance from Teller. ), great story, worthy of repeat viewing. I think I’m missing something (more that Caflin). I did not leave feeling like I’d learnt a lesson (Other than I need to curb my OCD of completing collections. Which reminds me, I need to buy a kinder egg on my way home), I think it’s ruined jazz for me and it certainly didn’t put the arts in a good light. This entry was posted in Movie reviews and tagged best picture, Oscar nominated. Bookmark the permalink.